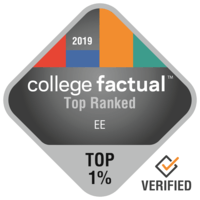 2019 Best Electrical Engineering Colleges in the U.S.
Electrical Engineering is a relatively popular choice with roughly 17,388 graduates per year. This major is ranked 30th most in-demand out of the 384 subjects of study reviewed by College Factual. Graduates with an Electrical Engineering degree have a 42.0% boost in income in comparison with other college grads. This means the degree is rated 7 out of 121 with respect to salary potential. EE grads will make an average of $61,394 for their early career pay and $103,601 for their mid-career pay. Explore the top ranked colleges and universities for Electrical Engineering majors. Some of the factors included in the ranking methodology include education quality, average earnings of graduates, accreditation, and more. Massachusetts Institute of Technology is the optimum choice if you are considering majoring in Electrical Engineering. In addition to its bachelor's programs, Massachusetts Institute of Technology offers graduate degrees in EE. Cambridge, Massachusetts is an ideal area for learners who enjoy the fast-paced city life. It's hard to beat University of California - Berkeley if you want to pursue Electrical Engineering as a major. Students who graduate from the ee program earn an average of $79,634 in their early career salary and $134,688 in their mid-career salary. University of California - Berkeley has one of the largest student bodies in California. It's hard to find a better school than Cornell University if you wish to study Electrical Engineering. In addition to its bachelor's programs, Cornell University offers graduate degrees in EE. Ithaca, New York is an ideal environment for college students who enjoy the fast-paced urban lifestyle. Stanford University is a great decision for individuals interested in an Electrical Engineering major. Stanford University offers graduate degrees in ee for those interested in an advanced degree. Based in Stanford, California, Stanford offers a dependable, suburban atmosphere for young people. It's difficult to beat Georgia Institute of Technology - Main Campus if you wish to pursue Electrical Engineering as a major. Graduates from the electrical engineering major at Georgia Institute of Technology - Main Campus get 6.0% above the average graduate in this field. The setting in a large urban center is great for young people seeking ample choices for networking, excitement, and exploration. Carnegie Mellon University is a great decision for individuals interested in an Electrical Engineering major. Ee is a popular choice at Carnegie Mellon University with over 163 graduates in 2017. Based in Pittsburgh, Pennsylvania, this institution is a very good option for students who enjoy the thrill of a significant city. Duke University is a great option for students pursuing an Electrical Engineering degree. In addition to its bachelor's programs, Duke University offers graduate degrees in EE. The setting in a big urban center is wonderful for students seeking ample chances for networking, experience, and discovery. California Institute of Technology is among your top options if you want to study Electrical Engineering. Graduates of the ee program earn an average of $71,477 in their early career salary and $121,662 in their mid-career salary. Positioned in Pasadena, California, this school is a strong choice for students who enjoy the exhilaration of a substantial city. The University of Texas at Austin is a great choice for individuals interested in an Electrical Engineering major. The University of Texas at Austin offers graduate degrees in ee for those interested in an advanced degree. The University of Texas at Austin is among the largest schools in Texas. It's hard to find a better school than University of Illinois at Urbana - Champaign if you wish to study Electrical Engineering. Ee students from University of Illinois at Urbana - Champaign receive an earnings boost of approximately 4.2% over the typical income of electrical engineering majors. With more than 20,000 students, this institution is one of the biggest schools in the nation. Students should not let costs stop them from applying to this school since 51.0% of undergraduates receive school funding. Due to the diverse population at UIUC, you'll have a lot of opportunities to meet students from all backgrounds. If you're interested in knowing more, you will find all of University of Illinois at Urbana - Champaign's rankings here.